QatarFax is an easy to use faxing solution that let’s you send and receive faxes by email or online from your computer, tablet or smartphone. 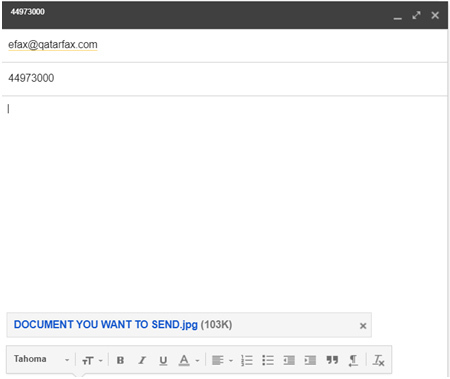 Sending faxes is as easy as sending email. Attached your document to be sent. You will receive a delivery or non-delivery fax email confirmation. You will receive faxes as emails, with the fax attached. Can we keep our current fax number? You still can use your existing fax number, but since we can't configure the e-fax service in your regular number, you have to forward your old number to the new one (Qatar Fax#) and this will change nothing, your clients still can send you fax to your existing number. To do this forward you need to contact Ooredoo and request a forwarding to the new number. Is my QatarFax number available all the time? Your QatarFax number is always on, never busy. Your computer does not need to be turned on to receive faxes. Faxes are stored in your email inbox. Do I need new/ special hardware or software to use QatarFax service? A-	You don’t need new/special hardware or software to have a QatarFax account. QatarFax manages everything, all you need is email address and internet access. Anybody from QatarFax team can see my faxes? How do I find out the result of my fax? When you send a fax, a delivery report will be sent to your email address. If the fax is not successful you will receive a non-delivery report with brief description why the fax failed. Are incoming and outgoing faxes secure? QatarFax provides a secure online fax service (FAX2EMAIL & EMAIL2FAX) with strong encryption and SSL access. Our encrypted fax service can encrypt incoming and outgoing faxes while they are stored on our servers, and encrypt fax confirmations saved on our servers. QATARFAX supports the most stringent regulations for data security and privacy. Our encrypted fax service can encrypt incoming faxes forwarded to you via email, via SSL or signed email. While this does not encrypt the transmission from your correspondent's fax machine to our fax servers, it does secure the contents of the message while in transit from our servers to your computer. QATARFAX can accept your outgoing fax documents via SSLor TLS-secured email-to-fax, so that the content of your outgoing mail is secure while in transit to your servers. For PKI, you initially obtain the QATARFAX public key signature (as a one-time action), after which you can encrypt your outbound messages. You may choose to receive confirmations on fax delivery (for success, failure, or all transactions). Normally, these messages are sent in plain, unencrypted format. However, you can choose to receive these confirmation messages in encrypted format. Hide destination fax number - add an extra layer of security by hiding the destination fax number from the fax header. User authentication – QATARFAX enables you to enforce access roles by authenticating users and operators of the online fax system with usernames and passwords. Automatic fax removal – all messages will be automatically deleted from our servers upon delivery. This ensures that no person, including QATRFAX staff, can view information contained in your faxes. Physical security - all our servers are housed in secure environments, which can only be accessed by approved personnel. Copyrights © Qatarfax.com All Rights Reserved.